In today's terms BIS go back a long way. They were founded in 1973 in the Vinyl Age. This may be as nothing compared to EMI, DG and Philips but among the big upper-middle-ranking ‘beasts’ their catalogue has real gravitas and depth. Their LPs - like their CDs - declared a pride in simplicity. Theirs was a commanding black background. They had an aversion for fussy detail and obstreperous colours. In a quirky touch their LPs and some of the early 1980s CDs carried a warning to consumers about the danger of damage to audio equipment if the recording was played too loudly. The quixotic and dashing Robert von Bahr, Managing Director of BIS always intended to record the complete works of Sibelius and to do so in style. This was admirable enough while it was still an ambition but now thirty-five years later it is halfway way to being realised. Typically he is doing this with exhaustive rigour. When brought to harvest it will take the form of an intégrale of 13 boxed sets. A de luxe wooden case for the whole series must be in the offing … methinks. Alongside the well-established core works will be rare original versions and world premières of juvenilia. When all is done and dusted this will come to between 60 and 70 CDs. Each set will include both previously released recordings and those completely new to the market. We will by 2010 be able to hear early versions of many of the symphonies and of Pohjola’s Daughter and much else. No-one else has done anything like this before nor are there plans to do it. On the other hand von Bahr is on a hiding to nothing because manuscripts will keep turning up. One can see a series of appendices having to be issued once the 13 sets have been completed in 2010. That said, no one has done anything better - difficult to imagine how they could ... or why they would. Things really took off for the BIS Sibelius Edition in 1986 - three years after D-Day for the CD. This was the point at which Andrew Barnett - one of the world authorities on Sibelius - began to organise the floorplan and detail of the project for BIS. Other BIS heroes include Erik Tawaststjerna and Fabian Dahlström among academics. We should not forget Breitkopf & Härtel, Folke Gräsbeck, Tuomas Kinberg of the Lahti Symphony and the many executants including Neeme Järvi and Osmo Vänskä. At the core of this endeavour have been two sets of the seven symphonies plus Kullervo. These were first recorded by the Gothenburg Symphony under Neeme Järvi in the 1980s and in the 2000s by the Lahti Symphony under Osmo Vänskä. Indeed Lahti was the scene of the launch of the Edition in September 2007 with the inaugural two boxes appearing at the International Sibelius Festival. offering original and final versions back to back. That this was possible is down to the trust von Bahr and his team have engendered with publishers, academics and critically with the Sibelius family. In scale it's a stunningly ambitious project. Who knows: when this is finished we may yet be offered an Apple I-Pod with the complete Sibelius on one machine. In common with all the others volume 6 includes a dumpy booklet in English, Finnish, German, Japanese and French. It offers full annotation together with Andrew Barnett's compact eight page biography of the composer. His grand Sibelius biography was published in 2007 by Yale University Press. In addition there is a separate 96 page booklet giving the fullest track and discographical details for the five discs. There's also a 13 page essay on these works. It's a hallmark of the series that the card box is oversized for the five discs, two booklets and series promotional leaflet. The contents seem rattle around in there. Each disc is in its own plain white sleeve with one face of it carrying a polythene insert through which you can see which of the five discs you are handling. Sampling the way through you will encounter some very pleasing moments. These include the first movement of the 1884 Sonata on CD1 - with its violinistic fluency pre-echoing the Humoresques. That aside, the other pieces here, including the Menuetto in D minor (CD1 tr. 8) are well crafted sentimentalities. The Andante Cantabile is rather Brahmsian (CD1 tr. 18). Jaako Kuusisto, who has recorded all the works for violin and orchestra for Warner, is the trusted and immensely fluent guide through these pieces. This culminates, on CD1, in the nicely varied Suite in D minor. Kuusisto continues in nasal tones for the second disc. Folke Gräsbeck makes something of the rhetoric of the piano part at the start of the Suite in E major from 1888. It's quite sturdy stuff before relaxing into the sweetest violin smoothness and a good deal of sentimentality. In the F major Sonata of 1889 the music is more ambitious yet is obviously in the debt of Grieg and Sinding. This music has considerable fibre and it is a strong piece in its own right though hardly characteristic Sibelius. At the end of the disc Nils-Erik Sparf and Bengt Forsberg offer the 1911 revised versions of Romance and Epilogue. These should appeal to anyone who loves the sonatas for violin and cello by Delius. There is string-shredding attack in the tempestuous emotions of the Epilogue where both instruments play an equal part in the romantic storm. Speaking of romance and storms, the next disc offers two versions of the Violin Concerto in its original 1903-4 original and its 1905 final edition. The violinist is the steady yet vibrant Madoka Ato alongside Folke Gräsbeck. The first version has more grandstanding virtuoso fireworks and discursive asides - seemingly to satisfy Novacek whose flawed early performances prompted a general tightening up of the score. To revel in convulsive explosive indulgences try the section of the finale from 1.24 onwards. Interesting to hear these versions with piano largely because there is no bluster or complexity of orchestral sound to obscure the soloist's line. If you want to hear the two versions with orchestra then there is BIS CD-500 with Leonidas Kavakos and the Lahti orchestra with Vänskä. It would be good to hear Sato in the Violin Concerto with an orchestra. He has done stalwart service here and gives his all in most impressive performances. CD 4 takes us to the more mature works. There's the rather damask-toned, even muffled, Scène d'amour from Scaramouche. It's sentimental stuff but not stirring. The same could be said of the soulful Two Serious Melodies: Cantique and Devotion which are heavy with autumnal colour and melancholia. The second echoes melodic lines from the Fourth Symphony. The first three tracks of CD 4 contain works also known from their versions for violin and orchestra. The opp. 78 and 79 pieces are pretty trifles written for publisher income though the Tanz Idylle is nicely pointed. The Sonatina op. 80 is from 1915 yet only gathers substance in the Lento finale. The op.81 Five Pieces include a debonair Valse - no doubt recalling the night-life of Helsinki - though not the nocturnal drinking sessions which wreaked such damage on his health. The final disc includes three sections of appendices - each comprising very short fragments likely to be of interest to students and academics only. Apart from these ten tracks we get the genre pieces which populated the pages of his catalogue for the years from 1924 to 1929. Sato tackles the five Danses Champetres which are alternately vibrantly emotional and moody but always shallow. These pieces can be heard as a sort of gazetteer of national caricature dances. The last one is certainly cheery. The seven pieces from 1929 opp. 115-116 are given German and French titles and declare their pedigree as written for desperate or opportunistic publishers. They are here played by Sparf and Forsberg The writing is slippery and accomplished and clearly challenges the player without raising deep emotional expressive requirements. Indeed the bone china Mozarteanisms of Rondeau Romantique rather make the case for this finding. As so often with the Sparf tracks in this set the sound for Forsberg's piano seems muffled or at least treble-deficient. Sparf's violin cuts just the right tone though. Rather like the Gräsbeck solo piano volume I, this box is more for the Sibelius completist than the general listener and those who are collecting the complete series will want this without reading reviews. The curious will find undemanding salon style pleasures among these suites, sonatas, sonatinas, pieces and fragments. It surprised me that there appear not to exist piano and violin versions of the Six Humoresques – in any event they do not appear in this collection. Those who must know every aspect of the story of the Violin Concerto will need this set for the lessons to be learnt about a concerto which the world has taken to its heart. For that you have CD 3 and the fragments and options on CD5. If on the other hand, the whole prospect of a shelf-worth of approaching seventy Sibelius CDs fills you with indifference then there is another option ... and it's from BIS. 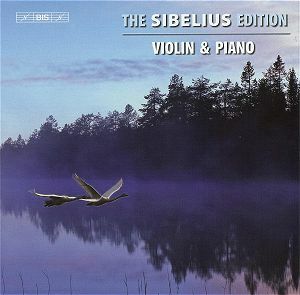 In 2007 they released a 15 CD box called 'The Essential Sibelius'. It cuts a broad swathe through the works. In it you will find all eight symphonies, all the tone poems apart from Nightride and Sunrise and a selection of the chamber music, choral music, solo songs and solo piano pieces. The price is good too. It's 15 discs for the price of four.